The Goat Wrangling Pondologist™ Blog | Creating Sustainable Environments with the installation of waterscapes and using goats to manage vegetation! Creating Sustainable Environments with the installation of waterscapes and using goats to manage vegetation! The Goat Wrangler and Pondologist in One! The Blogs New Make Over! After a few years of idle time its time for me to get back into blogging! Video has been my primary way to communicate (hence all the videos on my YouTube Channel @Pondologist). However, I realize my followers also enjoy the good old fashioned typed up form! I also plan to add some podcasts into the mix as well. I find myself getting asked a lot of questions about water features and the process of goat rental services for my other company called Goat Dispatch. I will have both Aqua Eden and Goat Dispatch link to this blog page vs doing different blog pages for each site. I still need to do a spam update for the comments, its shows I have 82,000 comments since my last post. Hopefully this will help me to find the real actual comments vs the spam ones. Cheers and It’s good to be back! Jake – The Goat Wrangling Pondologist! 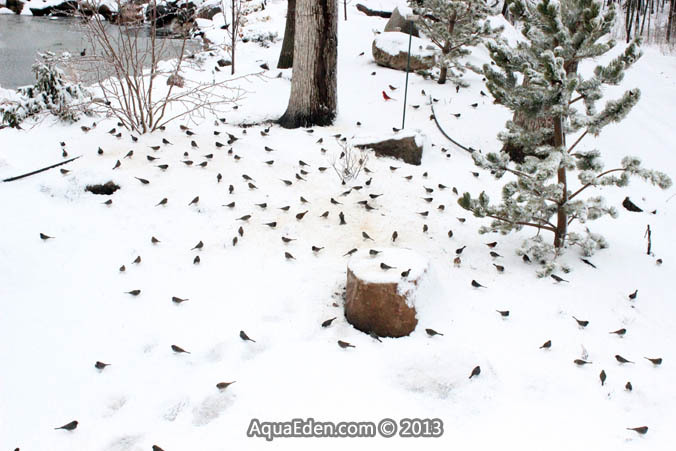 Backyard bird feeding frenzy after Spring snow storm! Spring Pond and Waterfall Start-ups in Minnesota Put on Hold! One thing I LOVE about birding is that no matter what the weather – birding is almost always enjoyable. When the warm sun is shining in the sky you can get lost in a woods for hours. Then when an ice/snow storm arrives in Minnesota the bird feeders are rocking! The Spring of 2013 has shown to be an interesting one for pond ownership and birding. 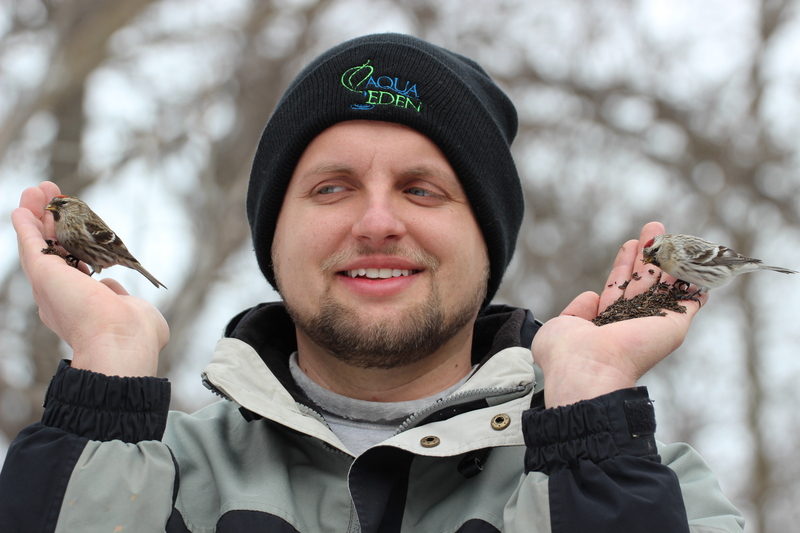 Last year at this time we were already on our third week of Spring pond cleanings and start-ups in Minnesota. This year we have not been able to start a single customers water feature. We are itching to get out there! While we wait – why not make the best of Spring snow storm by recording all kinds of exciting birds. The cooler temperatures and northern snow pack have left many birds “stacked up” while they wait to push on further north. There is a large overlap of birds that come to Southern Minnesota in the winter and birds that come to Southern Minnesota for the Summer. This has created an abundance of species and many of them you would not normally see side by side. On April 10th 2013 a major storm system moved into southern Minnesota. We noticed the outside feeders were being heavily used by ground feeding juncos and sparrows. After spreading out more white millet, cracked corn and black-oil sunflower seed the news seemed to spread around the bird world fast. 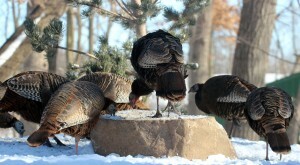 Wild Turkeys show up in our Backyard! I have heard stories that people are always excited to see turkeys for the first time but that they can turn into unwanted guests in a hurry! They are big birds and GOBBLE bird seed up in no time. These birds are still new to us so we love watching them! I am curious to see how long the romance will last! We plan to start offering whole corn vs the sunflower seed and white millet that I usually sprinkle on the ground for the cardinals, juncos and tree sparrows. 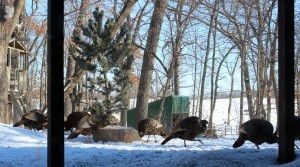 I have wondered why it has taken 4 years for the turkeys to finally move in and feed comfortably. My only guess is that we recently invested a lot into our backyard landscape by planting numerous plantings such as pine trees. We have also increased the number of brush piles in the woods that lead up to the feeding station. My next plan is to help them locate the open water source we have in our pond. I plan on doing this by sprinkling a trail of corn from their main feeding area up to the pond. 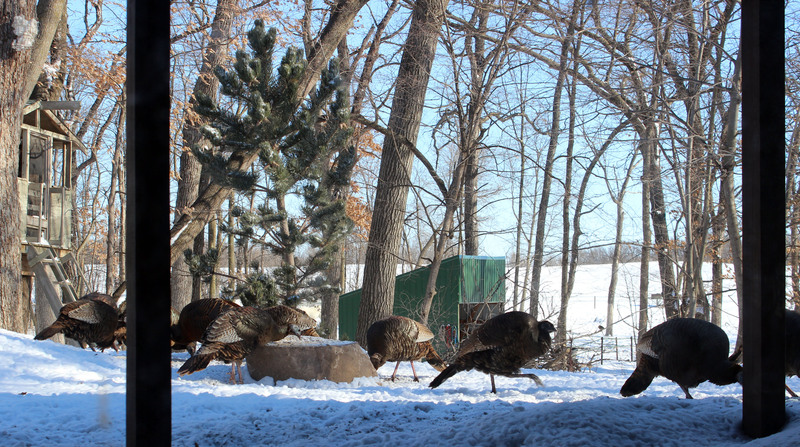 I am curious to see if wild turkeys prefer open water or if they prefer eating snow. what you feed them and how you offer it! Today we are having a good old fashion rain day in Minnesota. It is days like these in March and April where many of start to think about our landscaping, yards and gardens. I have just come across a program that has blown me away! This is something I have always dreamed about and look forward to seeing its many future uses. I have long been an advocate of citizen based science and this program I feel will do wonders for wildlife and for the people enjoying it. In a nutshell – Yard Map is a mapping program that uses Google maps as a background. You find your yard on the map and then use the tools to start creating boxes of the different habitats you have in your yard and then you add objects such as bird feeders, bird houses, snaps, water features, trees, vines.. etc. This program also can sync up with the other citizen based science programs from Cornell like eBird! Now you can map out your yard and edit the data over time. Instead of having your drawings in your file cabinet it is now online for others to see and learn from. Many landscaping mapping software is cumbersome to use! A 5 year-old could use this software – they made it that easy! You can click on specific items such as a tree and search the data base of the different species in the drop down menu. How often to do have someone come over and say what kind of flower or bush is that? When you have hundreds of plants you often forget. Now you have a resource you can go back to and look it up! Home owners can share these maps with contractors, landscape designers and wildlife managers to help them get a better idea in how their yard is set-up. I can now help give more accurate birding or water feature advice to my friends say in California. A great way to keep track of what birds are using what trees. When you add an object such as a snag(dead tree) to your map you can go back and add comments to that object. Now when a Northern Flicker makes a nest inside of the snag you can record it and see if they use the same snag year after year. You can also attach pictures of the actual snag for others to see! You could do this type of thing with all the plantings in your landscape! Your data is used by scientists from the Cornell Lab of Ornithology – Citizen based science project at work! Information overload – This program is packed with all types of tips on how you can improve your yard. You can also “Share” your yard on social media sites and start having discussions. I encourage everyone to check out this program and help unlock many of its great uses. I have shared what I have so far in my yard at the larger scale. As I get the time I will start to re-size the trees and plants and get them down to the micro-level. Every plant will be mapped out down to the smallest detail! I plan to map out all of the good snags in my forest and keep track of what birds are using them. Personally I would love to see species specific discussions on what plants birds are using. Often we hear such and such a plant is “good for birds.” That is all fine and good, but I want to know down to what species… what time of year. .. A goal of mine is to have my favorite bird, the white-winged crossbills, visit my yard one day! What species of spruce are people having the most success with? What type of cover are the Varied Thrushes using when they show up in the winter? What type of berries are the Eastern Bluebirds eating in early April? We now have a platform where these types of discussions can take place! Amazing!!!! I would love to hear your stories and see you post your yards in the comments section of this blog! The current 2012-13 winter season has been classified as a “winter finch invasion” year in the United States. Many bird species such as the Common Redpoll, Hoary Redpoll, Pine Siskin, and other finches are moving south from Canada in search of food. It’s still not too late to get some of these birds to hand-feed before they return back north soon! I believe the Common Redpoll is an excellent bird to hand-feed. While filling the feeders, you may notice this species is often the last to flush and one of the first birds to return. I was amazed at how I was able to hand-feed the redpoll flock in my backyard on my very first day trying this season! Many other species take days, weeks or even months to train! 1.) 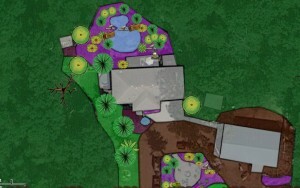 Create an all inclusive backyard environment. The goal is to create an area where the birds have little reason to leave your yard. Once the birds start to get a consistent habit of hanging out in your yard, they will start to get more accustomed to you. A good backyard environment creates a vacuum for other bird species. Birds are in tune with other birds around them and when they notice a lot of activity, they are drawn in. Food – Fill your feeders (do not let them go empty!) with proper seed. Common Redpolls prefer thistle seed and sunflower chips. 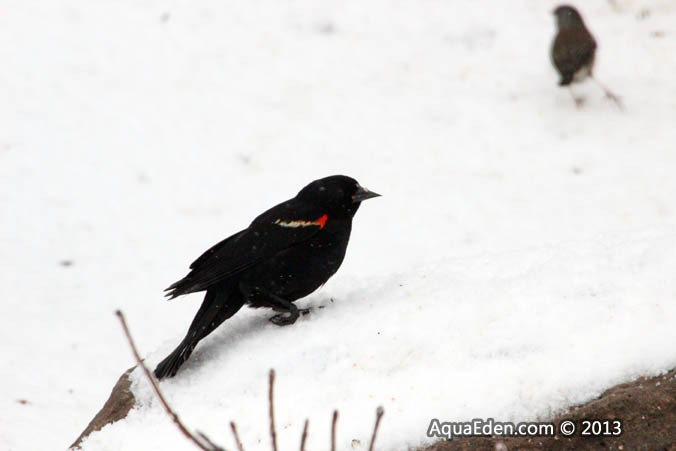 Water – Provide on open water source such as a bird bath heater, heated fountain, stream or open water in a pond. Shelter – Provide cover through plantings of deciduous and conifer trees and bushes. 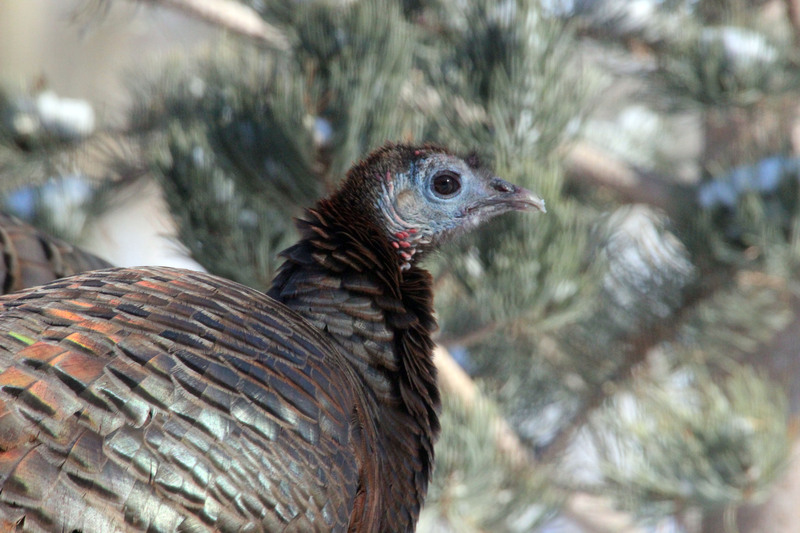 In the middle of winter, you can put out used Christmas trees after season or collect brush and make brush piles for ground feeding birds. 2.) Timing is everything! When you make your first attempt, try to feed right after a snow or ice storm. 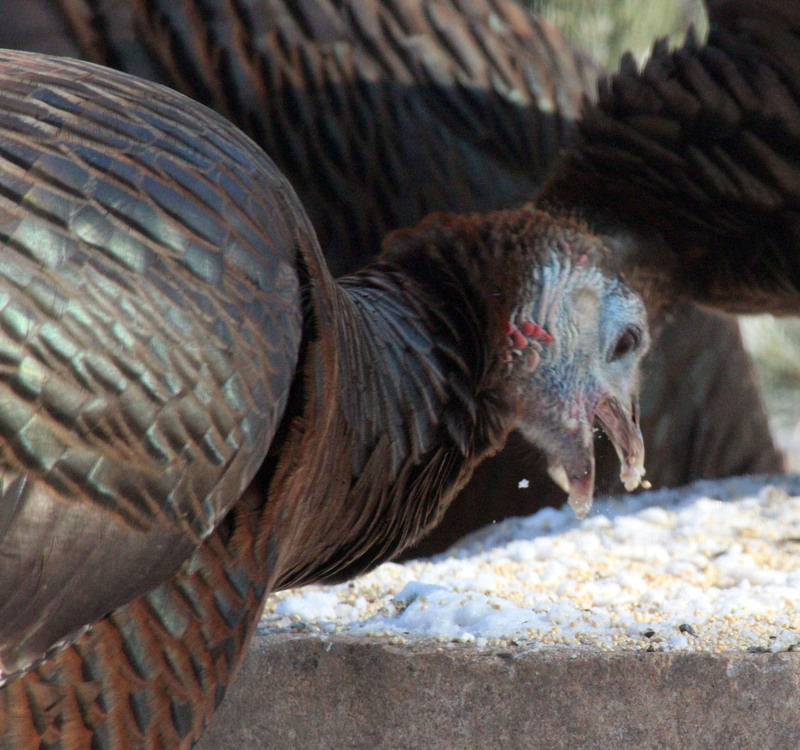 The birds will have a hard time finding their natural food sources and will be more likely to feed in your yard. If you do not have a pending storm on the horizon, pick the coldest/cloudiest day you can. Earlier in the morning seems to work best. 3.) Take all but one feeder down for your target species. You now have a large flock of your target species feeding in your yard. It is time to limit the number of feeding ports they can feed on. You want to position the one feeder so it is about chest high next to you when you are standing or sitting on a stool (you can do this by adding extension ropes to your feeders if they are too high). Note: I do not take ALL of my feeders down when I do this. For example: I leave my suet feeder up for the woodpeckers because my target species, the Common Redpoll, do not eat suet so there is no competition while I attempt to hand-feed. I also continue to feed white millet on the ground for the juncos and cardinals. This ensures that the other birds are still able to feed and do not move on! When designing backyards for customers, I prefer to have bird feeding stations set up in “zones” vs. having all of your feeders on one pole. A few “zone” examples include: Finch, woodpecker, and cardinal zones. This zone-style feeding also pairs well with hand-feeding wild birds. When you are working on feeding the finches, the other birds can still feed in close proximity to you and in essence you are training future hand-feeding target species to get use to you while you are working with the finches. 4.) Stand/sit next to your feeder. When setting up, you want to be standing within arm’s reach of the feeder and turn your face so you can just see the feeder out of the corner of your eye. With seed in your hand, hold it next to the feeder. If you have a tray on your feeder, rest your arm on it so you don’t get tired. Once set-up, you do not want to move a muscle! I also recommend closing your eyes as the birds start to come in. 5.) Wait for the feeding frenzy and then make your move! The birds will start to get vocal and many of them will be more concerned with fighting for a good spot on the feeder than your presence. Slowly start to open your eyes and see how the birds react. Some will stare at you for a few seconds and then keep on feeding. Slowly (a ¼ inch a second!) move your hand toward the birds if they haven’t landed on it yet. Then you can slowly move your hand to the feeder perch and try the “scoop method.” The scoop method involves slowly sliding your finger down the front of the bird and leaving the bird no choice but to jump on your hand or fly off. 6.) Move bird in hand away from feeder. The birds are starting to associate your hand as a feeder. We now want them to get use to your hand out in the open and not touching their perch feeder. Slowly twist your body and arm so the bird in hand is about a foot or two from the feeder and let it feed. Other birds will start to land on your arm and head as they wait to feed on your hand. Keep feeding new birds as they fly directly to your hand. 7.) Optional: Take down remaining feeder. If you really want to create a feeding frenzy, you can take the last feeder down and stand by your feeder pole or branch with hands open. The birds will start to fly from the feeder pole to your hand and eventually straight from the tree to your hand. If you have the time, you can start to practice feeding the birds farther from the feeding station area to get them use to feeding wherever you are in your yard. – During harsh weather, I recommend that your bird feeding sessions not last more than 30 minutes at a time. Go back indoors and give the birds a break so the other species can continue to feed. This off and on technique is easier on the birds and you! This is also a great time to warm up your hand if you are feeding without gloves on. – I believe the Common Redpoll is easier to hand-feed than the traditional bird of choice, the Chickadee. This is especially true if you have a large flock of redpolls at your feeder. – I have not noticed a difference in behavior when feeding the Common Redpoll and the Hoary Redpoll (Some believe that these birds are a variation and not a separate species). Both species seem to be just as likely to hand-feed. I believe hand-feeding wild birds can be one of the greatest ways to connect with your backyard bird friends. There is something magical about having a wild bird so close and comfortable with your presence. For some odd reason, when my redpoll flock is alarmed and they fly to the trees, the one bird in my hand stays and continues to feed or is the last to fly off. At first I figured it might be the same bold bird of the flock; but after feeding many different males, females, white hoaries, and really white hoaries, I realize it’s not always the same bird. I’m curious if any of you will notice this in your own backyards. Birding offers many levels of interaction for all skill levels. I have noticed an increase in the amount of young birders joining our local bird groups. 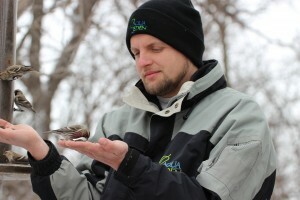 Hand-feeding birds is a great way to get the youth hooked on birding! Once the enjoyment of birding has begun, it’s fun to start a bird list of species you have seen. Some examples of types of lists include: state, yard, birds seen on a wire, birds seen in all 12 months of the year, birds found nesting and so on. I keep a state, county and yard list as well as “birds seen while on horseback” and “birds that I’ve hand-fed”. I hope this information helps you add some birds to your “hand-fed” list. I look forward to hearing your comments or questions and hearing your success stories. 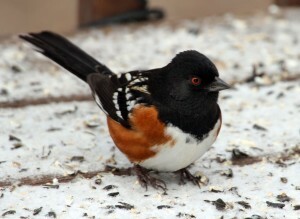 Spotted Towhee Visits Faribault, MN – A fun and exciting bird! It was late afternoon on Sunday, January 13th 2013. I’m working in my shop when my wife, Amanda, comes rushing in yelling, “Come quick! There is a rare bird at the feeder and I don’t know what it is!” I ran inside the house and looked out the kitchen window but did not notice anything unusual. She directed my attention to the display on our camera where she had some great close up pictures of the bird. Instantly I recognized the bird as a type of towhee. After checking the bird book, I was able to conclude that this bird was indeed an adult male Spotted Towhee. I’m very proud of my up and coming birder wife! She had learned from previous sightings that pictures are worth their weight in gold when it comes to convincing her husband about a bird that was seen (she still swears she saw a Snowy Owl a few years back behind our house but I’m not sure I can believe her!). With the towhee, she made sure to get a picture of the bird and THEN come and get me. – Brush Piles: Last fall I was clearing out some buckthorn in our woods and placed it in a large pile. My intent was to burn the brush pile but I ran out of time. Now I’m glad I didn’t! This brush pile proved to be one of the towhee’s favorite hang out spots and he was likely to be found there any time there was danger or between feedings. – Food: His food of choice is white millet and black-oil sunflower seed scattered on the ground. Some days he seems to feed heavily on the millet and other days more sunflower seed with no real preference observed. – Habitat: When not spending time in the brush pile, the towhee loves to hang out in the newly planted conifers around the yard. Last fall, my company, Aqua Eden, installed a backyard water feature surrounded by conifers, mulberries, and crab apples. I started to scatter seeds under the conifers and he seems to enjoy scratching deep in the leaves and the fallen pine needles for food. Just as interesting as the towhee was to meet and visit with the different birders that have come to see the towhee. From teenagers to people in their 80’s, it’s been a joy to talk and share birding stories. I wished I would have started a log book of all the bird watching visitors we’ve had…there were at least 60 different people with the farthest being from Ohio! Spring is nearing and I’m afraid our days are numbered with our beloved towhee. Before long, he’ll be headed home…probably back out west. Even though the bird will leave, the memories and new friends will never be forgotten. 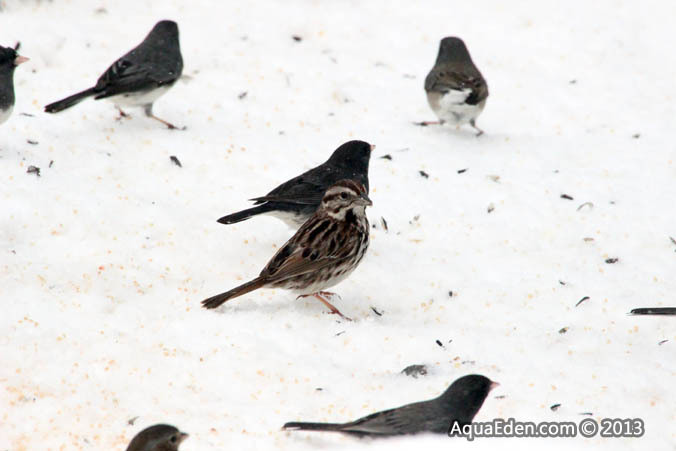 A new twist for pond owners to keep open water for wild birds in winter! 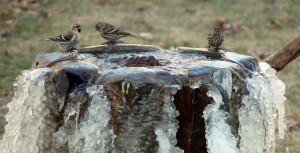 Check out our Birds In Water Features Picture Gallery for more pictures of birds enjoying water! The Pondologist Blog – Backyard Wildlife Education from Wild Birds, Ponds, Fountains, and More! Indoor Water Wall Projects – In the winter time we migrate inside because we are totally passionate about water! You will not find us plowing snow or putting up Christmas Lights!